Evade Martial Arts offers a wide variety of classes of which are designed and focused around educating and inspiring you or your child in the world of martial arts. Within this page there is a list of the classes we offer and information about them. 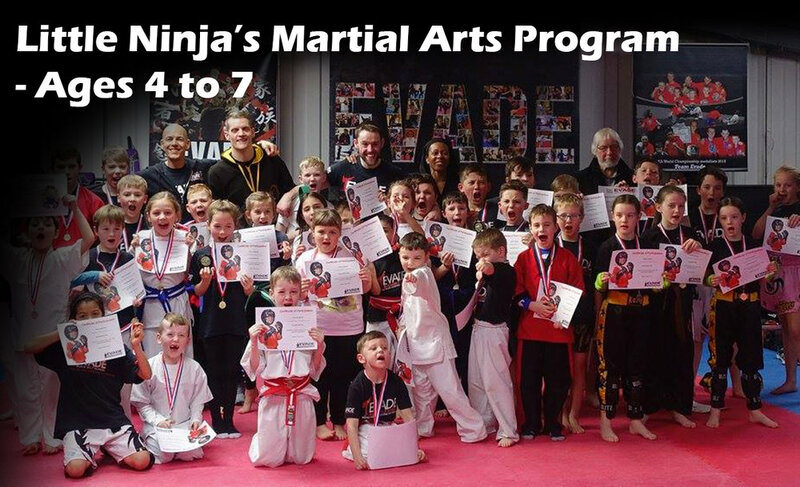 Evade Martial Arts offers a wide variety of classes of which are designed and focused around educating and inspiring you or your child in the world of martial arts. Our school offers four main programs of which are targeted at different age groups and styles of martial arts, each program is designed with different focuses to enable you or your child to achieve the most from the sessions attended. All of our programs not only teach the valuable skills in martial arts but also skills and attitudes that will benefit you both when training and in your personal life. Evade teaches a mentality focused around discipline, respect and confidence. This mindset will advance your training in martial arts and improve your life outside of it. Please find below information on each individual program and how to get started. Simply click on the image to find out more and to arrange a free induction session. Please find below a schedule for the classes we offer. All red boxes are part of the adult programs, the blue are part of the children's programs, the green are part of the little ninjas program and finally the orange is part of the Ladies Only program (who can also attend standard adult classes). In addition we offer an 'open mat'. At any point where the gym is open and classes are not on please feel free to come and train on the mats to practice technique and improve fitness and conditioning in your own time.